My family is quite small, and by small I mean there are four of us. Yes, four... my mom, my dad, my older sister and then me. While I attend university across the country from my family, my sister is also in college while completing an internship. While my father works full-time and drives a long commute every day, my mother constantly runs errands and keeps each of our lives in order. Even though school has ended for the summer, we still have hectic schedules and family time doesn't come around very often... family time isn't "penciled in" like an appointment or checkup. Family is the most valuable thing one should cherish, but oftentimes it isn't made a priority. 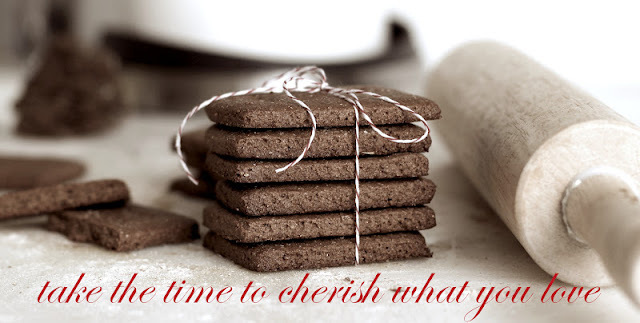 This may sound silly, but I truly realized this when I was baking these graham crackers. The fragrant scent was literally bursting out of the oven, to the point where I just wanted to rip them out of the oven halfway through and eat them in partially baked form! But I was patient. The aroma was so enchanting that it drew everyone in the house together in the kitchen. And what a comforting feeling it was--something sweet baking in the oven, the family all together, chatting away in anticipation for the soon-to-come treat. Standing there in the kitchen with my family, I stood back. This was an experience I found to be rare, an experience very worthwhile. We all have jam-packed schedules filled right to the brim, but it would mean so much if we took the time to be with the people we love and care about, even if it's only for a couple of minutes. Get ready a little faster, hug a little longer, and leave a little later. Every second counts. **I made this recipe a few times with different variations. 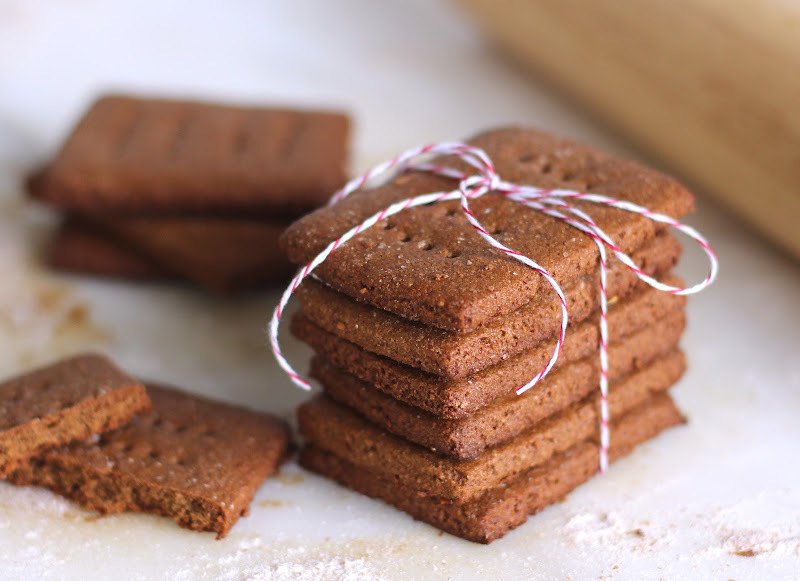 The trial listed above created a mildly sweet cracker, but you can add 40 drops of stevia extract if you want it sweeter. In my next trial I used Truvia baking blend (which contains real sugar, but it was an accidental purchase! I swear!) 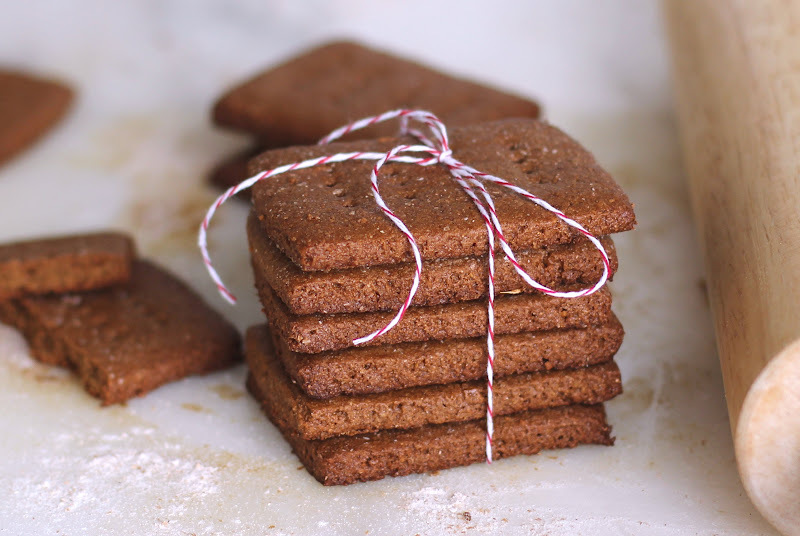 instead of sucanat, vanilla paste instead of extract, and baked them at 375 degrees for 10-12 minutes... this created sweeter crackers, similar to the ones you'd find in the store. I think this is a recipe you can easily adapt, so I think the next time I make these I'll use sucanat, vanilla paste and 40 drops of stevia. 1. Tape down a large square of parchment paper onto your counter using a sturdy tape (I used packing tape around all four sides) and line a cookie pan with parchment paper, set aside. 2. In a small bowl add the Dry II ingredient (whole wheat flour) and set aside. 3. In a medium-sized mixing bowl, add the Dry I ingredients and whisk, set aside. 4. In a small bowl, stir together the Wet ingredients. Pour this over the Dry I ingredients and stir. Sprinkle some of the flour set aside (Dry II) onto the mixture and mix in using your fingers. Do this until the mixture can form a kneadable ball. 5. Dust the parchment paper square with the flour set aside (Dry II) and knead the dough, adding more flour when needed. Once you form a ball, let the dough sit for 10 minutes. 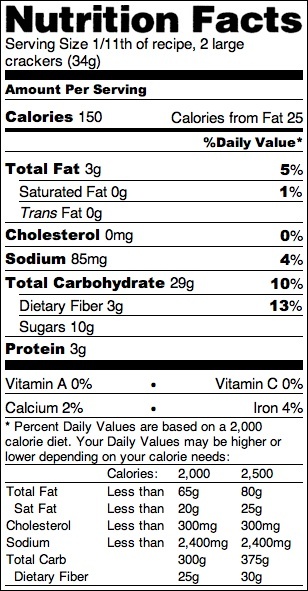 Because everyone slices their crackers differently, this nutrition label may not be accurate for you. I made the label for the first batch of crackers I made (which made 22 large crackers), but in the next batch I got 34. 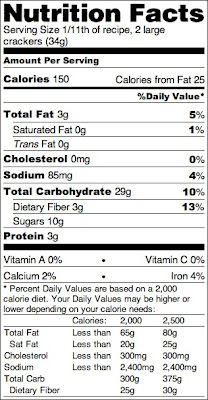 Overall though, this is a nutrition label I can be proud of and the ingredient list is 100% natural and healthy. QUESTION: Do you find family time hard to come by these days? 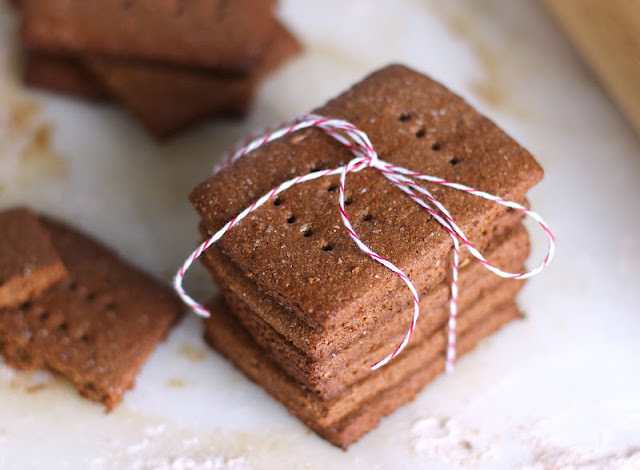 Yes, finally a whole foods version of a graham cracker! I have been searching for one, thanks! Would coconut oil be okay in place of the walnut oil? I'm sure coconut oil will work as long as it's soft at room temperature or in liquid form. Make sure it is safe for high temperatures though, I accidentally bought a jar that was only safe below 300 degrees F.
These look amazing! Do you think adding in some chocolate protein powder or cocoa powder would work for a chocolate version? How did I not think of a chocolate version?! D: Hmmm, I would try replacing 1/2 cup of the whole wheat flour with 1/2-3/4 cup of cocoa powder. You may want to give the dough a taste because it will probably need more sweetener (I would suggest adding 1/2 tsp of stevia extract to make it easy, otherwise you can try increasing the sweetener of choice). I happy that there is a baker out there who carries a torch for healthy baking. Low sugar and fat is my kind. Absolutely gorgeous. I love baked goods that remind us of family times. I made a apple berry cake last month that had a similar effect on my spirit while the smell filled the house. Wonderful pics.